Our range of products include coating system replacement part, shaft and wheel, barrel nozzle, metal turbine, nozzle tip and nozzle guide vane. To meet the various requirements of the customers, we are involved in providing Coating System Replacement Part. 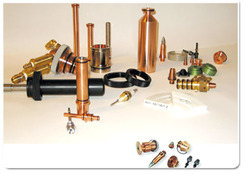 We offer a wide variety of replacement parts which are demanded by various industries. We make these parts by using exception quality raw material procured from reliable vendors of the market and utilizing contemporary technology which is in sync with the industrial standards. Furthermore, we offer these at market leading price and ensure timely delivery of the product. With the thorough understanding of the relevant industry, we are offering a wide range of Shaft & Wheel. Our provided shaft and wheels are ideal to be used in different equipment and machines and come with simple adjustments. We diligent professional engineer this product in compliance with industrial standards by using top grade components and latest technology. Further, our products go through a rigorous quality check to ensure their flawless performance. We offer these at market leading price to our valuable clients. Fostered with vast industry proficiency and knowledge of this domain, we are bringing forth an extensive array of Barrel Nozzle. Highly acclaimed for efficient working and lightweight structure; the offered barrel is suitable to be used in various machines and equipment. The product is designed utilizing the supreme quality raw material and current technology in fulfilment with the set industry standards. Besides, we provide this barrel nozzle at a reasonable price and ensure delivery within the given time frame. With vast and rich industrial experience, we are offering a comprehensive array of Stabilizer Fin And Control Surface. The offered product is extensively used by various industries and is available with us in varied specifications to meet the needs of the clients. Our dexterous professionals design this product in tune with industrial standards by utilizing ultra-modern technology and excellent quality components. Our products are dispatched in the market only after stringent checking by our quality examiners.